Jessica S. Kern joined The McKeon Law Firm as an associate in July, 2010. With deep roots in Montgomery County, she is passionate about the practice of family law. 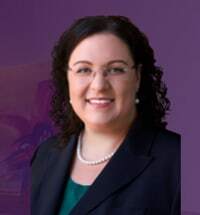 Prior to joining the Firm, Ms. Kern gained valuable experience working for four years as both a legal intern and associate at the Montgomery County family law firm Paradiso, Taub, Sinay & Owel, P.C., and volunteered her time as an attorney at the Montgomery County Circuit Court Family Law Self-Help Center. Ms. Kern represents clients in all aspects of Family Law with experience in Montgomery County, Frederick County, and Prince George’s County, among others. She handles cases involving contested and uncontested divorce, division of property, alimony and spousal support, child custody and visitation, and child support. Ms. Kern negotiates for her clients during mediations, both before and during litigation, to help clients reach Prenuptial Agreements, Marital Settlement Agreements, and Custody Agreements. Ms. Kern also vigorously advocates for and supports clients through contested divorces, custody cases, domestic violence, modifications and enforcement of orders, in addition to other family law matters.